The Best Family Travel Youtube Channels from thousands of top Family Travel Youtube Channels in our index using search and social metrics. Data will be refreshed once a week. 1.15 Spot The Scotts // RV Travel & Family Life! About Youtuber We believe travel changes your DNA. We're on a mission to have as many travel adventures with our family while we can while our kids are still young. Kids grow up fast. We're intent on making the most of that time! We post a daily travel vlog of our adventures and vacations! We are NOT the typical family of four! We have a fun, crazy, and funny life full of adventure. About Youtuber Travel With Kids shows real travel, not "hidden behind the scenes" that a real tourist or family on vacation would never encounter. We dont eat wierd bugs the entire show and take you to unrealistic places, just real family fun. About Youtuber Welcome to the Williams Family Fun Adventures Youtube Channel, were we show you how to put the fun back into everything. We enjoy spending time together traveling, trying foods, & the exploring the outdoors. About Youtuber We're travel addicts and clock up over 16 years of world travel. We believe that if you travel more you create better memories. We're on a mission to prove that travel does not have to stop once you have kids. And that kids make some pretty fearless and fun travel companions. About Youtuber We are a family of travel enthusiasts (exploring the world at least 8 days a month) and adventure seekers who love fitness, good food, happy thoughts and above all a life filled with lot's of love and fun... This channel is Family Friendly! Come along for the ride as we feature our daily lives as well as all the fun events we go to and amazing trips that we take. About Youtuber Hello world! We are the Gee family. Just your average young family exploring the planet. In 2015, after finishing school, we decided to sell everything and adventure together around the world. About Youtuber Welcome to our crazy life! We are a family of 11 who are road-tripping around the world. Homeschooling, teaching about natural living, and taking in as much of this awesome life as we can! Come along for the ride! About Youtuber We've traded in our house for RV living full time! Join us as we share our continual struggle of letting go of clutter so we can embrace life. About Youtuber Last year, our family of 6 sold everything to travel the country full time in an RV. This year we have a NEW ADVENTURE, we again have packed up our things this time we have moved to South America. We hope to show you that a life of happiness doesn't come from stuff, but from experiences. We hope to redefine the meaning of success and happiness. About Youtuber Trent and Siobhán are a husband and wife singer-songwriter duo raising their 5 sons on the road full time in a nearly vintage Foretravel motorhome. Their original songs speak of adventure, bravery, reaching out to others and trusting in a God who never fails. Come watch as they cross the nation in search of the joys of life and sharing them with others. 15. Spot The Scotts // RV Travel & Family Life! About Youtuber We're The Scotts - a young-ish thirty something couple who traded the typical American Dream for a dream of our own creation - full time RVing and traveling the country while working for ourselves. The future is now. Why wait?! About Youtuber Full time Travel family taking the leap and setting out on a 50 country journey over two years in an RV (Motor Home) all over Europe. We are a family who made the leap to give up the daily grind and travel the world. We only have a few precious years to journey as a travel family to spend time with kids until they launch on their own individual journeys. About Youtuber SUBSCRIBE for fun, expert, family travel advice, photo tips and ADVENTURES! Adventure Family is for fellow adventure families! It's for the parents and kids! And warning, we think we're pretty funny (especially Brian! LOL!). We want to inspire you to unplug from life's demands and share an adventure together! About Youtuber Our Family Videos and more from around Australia & The World. We love flying, 4WDing, Animals and just exploring & having fun in general. About Youtuber Adventures around Australia in a Caravan!! A young family's travels showcasing great destinations, sharing travel tips and inspiration through photography and videography. We work with brands/partners and sponsors to fund our travels. About Youtuber What is Sailing Trip Family ? A french family who decided to change his life. In 2014 we decided to sell our house and to buy a sail boat to circumnavigate the world. About Youtuber An Inspiring American family, who've been full-time traveling with kids since August 2012! About Youtuber Join our family of 5 as we share our adventures across Northumberland, Newcastle and beyond. Expect days out, restaurant reviews, holidays, family product reviews, family life plus the odd fashion, style and beauty post too. About Youtuber TravelingMel brings you videos of family adventures in the great big world in which we live. Her family and solo adventures take her to wonderful outdoor locations as far afield as she can get, preferably IN the field. TravelingMel loves nature, loves her family, and loves sharing tips and information to help you enjoy your own adventures. About Youtuber We're Micki and Charles. We started traveling together way back in 2003, and today we sharing the joy of travel with our two little adventurers. We're all about the travel, the tech, and (of course) the ice cream. About Youtuber Where do you want to go? Family Travel reviews and stories active families. My name is Paula and I am a Mom of two teenage girls. Travel is my respite. We are from Ontario, Canada. We are a family of skiers, skaters, martial artists, and travellers who live for zip lining, horseback riding, yoga, sports and cruise ship adventures. WHEW!! We work so that we can cruise into the sunset. About Youtuber Can you really keep travelling with a child in tow? After visiting more than 60 countries around the world, I wasn't about to pack away my passport when I became a parent. Racking up 17 overseas trips aged four and countless UK holidays, we've survived long-haul flights, British motorways and teething/tantrums in the sunshine. Here's a taste of some of our family travels. About Youtuber Capturing Disney Magic for all to enjoy! We will be posting VLOGS, Deluxe Resort Tours, Room Tours, Dining Reviews, and lots of family fun! Check back often to stay up to date. We are Disney Vacation Club members, and we LOVE Disney World! About Youtuber Join us on a travel journey of exploration and adventure. We want to inspire you to make your dream family holiday a reality! Inspiration in the format of travel tips, recommendations & stories for parent-escapes and family travel. About Youtuber We bring wilderness adventures and survival technology to the modern family with nature activities, travel tips, and gear reviews. About Youtuber Welcome to the Tin Box Traveller YouTube channel! I'm Claire - a mid-30s mummy to a busy primary schooler and smiley toddler, and wife to a Royal Navy Officer. Tin Box Traveller is a UK family travel blog that I use to share our adventures and inspire others to explore new places. About Youtuber Our family travels quite frequently out of state and abroad with our two young kids. We usually document with photographs, but now we want to share a bit through videos. About Youtuber This channel is all about our family making fun movies to remember our normal days and all of our Walt Disney Family Vacations. About Youtuber Keep up with travel tips, information about destinations, maybe, do and don't places to visit, and general inspiration that you can still do anything after kids. About Youtuber This channel is about family travel, advice, traveling with kids, trip planning, travel planning, hotel reviews, travel tips, product reviews, and getaways for spas, moms, and couples. About Youtuber If you are reading this, you have stumbled across All About Family Travel - a collection of our travel memories, impressions and stories from all over the world together with other very useful information related any kind travel like popular attractions, accommodations, itineraries, restaurants and much more. About Youtuber travelBIGO = Before I Get Old. Family Travel Forum has been the trusted family vacation planning resource for traveling the world with kids since 1996. And we still don't feel old. Join us. About Youtuber Award-winning full time traveling family of 6- join us for full time travel, gentle parenting, budget family travel, homeschooling and vegan adventures! About Youtuber Sharing our family travels to show others that traveling with kids is not only possible, it's affordable! About Youtuber Travel Blogger, Photographer, Geocacher, Hiker, Runner, and Camper, sharing our family adventures with kids, parents, grandparents & couple getaways. About Youtuber This is our kids and family travel channel! About Youtuber Family travel from the kids' perspective. Two young travellers share their thoughts and experiences as they travel the world. It's a great adventure filled with unbelievable experiences! About Youtuber Family Travel at it's finest! Over 3 years of global family travel, 50 countries. Still on the road, with the kids and loving it!. About Youtuber We3Travel is a family travel blog offering destinations guides, travel tips, and reviews. Follow our family of three as we seek out the best family travel destinations, find educational and cultural experiences to enrich the travel experience, challenge ourselves with new adventures, and try the best food in every city! About Youtuber I'm Elizabeth - Family travel blogger at www.wandermum.co.uk. I've always loved to travel and didn't want to stop when I became a mum. Watch my videos to see how we navigate the world with two daughters in tow. Get tips on family travel and UK days out too. About Youtuber We are the "unofficial" bucket list family, my name is Loren, I'm originally from Romania, and my wife, Julie is from New Zealand. We have a beautiful baby daughter whose 6 months old and before we had her we loved to travel so we would like to share some of our memories. Each week we will be posting a video of places that we've been. About Youtuber "Where Past Meets Present", this means where as a child you enjoyed these places and now as a adult we reflect and see how the present has changed them. We are a fun channel where people can relax and not be offended by harsh tones of language, political views, and other opinions. In the end, the important part is just relax and enjoy because we do when creating them. About Youtuber Hi everyone!! We are a Family of three that enjoy exploring, camping, adventuring, road trips, overlanding, and national parks. Follow our family trips as we visit the great outdoors and share our love for nature with our daughter. About Youtuber Adventure Travel Family || Full time travel family with five kids. Inspiring you to travel more and teaching you to live A Playful Life. About Youtuber Family adventure on the road! We're a family of 4 plus our kelpie cross Bobby - finding the best family and pet friendly spots around Australia. Doing a lap! About Youtuber Family of three in love with family travel and finding fun and unique things to do, places to stay and eat. Watch our kid friendly videos to help you plan your upcoming family travels. About Youtuber We are the Soja Family (Sam and Trisha and our 2 boys, Evan and Ryan). In October 2017 we embarked on an around the world adventure. About Youtuber Welcome to The Family Day Trippers. A channel highlighting a selection of family day trips and activities across the Uk. From thrilling theme parks to the piece and tranquillity of a National trust property. You'll find something here for everyone from the family new born up to to your Gran and Gramps. About Youtuber TaawkTV is a growing channel for Nomadic Family Travel and Real Travel Families. We aim to develop a platform in which travel families can showcase their videos and benefit form being included in the TaawkTV network for travel families. About Youtuber The YouTube home of Leslie Harvey, family travel blogger and publisher of Trips With Tykes. Simplifying travel with babies, toddlers, and young kids! About Youtuber Hi there I am Sarah and this is the YouTube Channel for my family, travel and lifestyle blog Extraordinary Chaos. I will be sharing our adventures, loves, likes and a few recipes along the way. About Youtuber Globalmouse are all about travels with family. You'll find adventures everywhere from Russian night trains to the beaches of Cornwall. About Youtuber Hi, We are 4 members family, and all of us like to travel. From different countries, we have a lot of Gb pictures and movies, and we would like to share this information with families around the world who are planning to travel with their families and to share our individual experience which is in majority cases are unique. About Youtuber Meet the Wise's...a family of three who love to cruise, vacation at resorts and enjoy amusement parks and local events. We share our experiences with our videos of our family/friends trips..but also our travel tips and tricks, because we're also travel agents. Please like and subscribe to our channel...and give us a thumbs up! About Youtuber Video channel for award-winning family travel blog My Travel Monkey. Follow our adventures at home and abroad. Inspiring family days out and holidays as well as tips and travel guides. May you all have a marvellous adventure! About Youtuber Travel Vlog based on the travel adventures of Chic Family Travels. About Youtuber Hi, I'm Jess and together with my husband Jon and our sons Rylan and Archer we invite you to join us on our family adventures. We hope that we can inspire you to explore, create, love and make your own adventures. It doesn't have to be difficult or expensive, exploring and learning with your kids can be heaps of fun, so get your kids off the screen and get out there. About Youtuber A kid and family friendly YouTube channel. Featuring Family travel and entertainment. My name is Titilayo. I enjoy watching kids friendly YouTube video and travelling.so I asked my mum to help put together some videos from our trips,that was how the channel came about. About Youtuber Welcome to Average Family Travels! We are the Kite family! We are a family of 3, soon to be 4(! ), or even 5 if you count Jasper dog. We are currently living in Germany and trying to take every opportunity to travel. We're not one of those families that sold everything and travel the world full time. We are a working family with a rambunctious boy and soon to be little girl. About Youtuber Travel Loving Family (www.travellovingfamily.com) is a family travel blog which shares travel tips, holiday reviews and destination guides from our travels around the UK and abroad. Lisa, Editor of Travel Loving Family and Editor of Trips100 (the UK's largest travel blog directory) has travelled to 80 countries and worked in the travel industry for 20 years. About Youtuber Our family loves going on vacation, and we also love sharing those vacations with fun videos on Youtube. About Youtuber We're the Johnson's. A family of 4 travelling the world whilst juggling business and home schooling our 8 year old daughter and 5 year old son. We're documenting our journey alongside sharing tips and tricks for travel and business with a bit of family thrown in! About Youtuber Hi! My name is Jackie. I am a married stay at home mom of three that has a passion for travel and adventure! I've created this channel to document our trips and to inspire others to travel with their family. About Youtuber We are a very lucky family. Jon is a pilot and I work for a travel company. This, plus a love of avios points (frequent flyer miles) has allowed us to enjoy the most incredible adventures in the last 12 months. About Youtuber Making traveling with kids easy! We are a network of travel families sharing the best content for traveling with kids. This channel will show you a personal VLOG of Katie n Kids, a solo mum from Australia trusting her instinct and taking her kids out of conventional school to learn from the world. About Youtuber Just family adventures...trips, outings, hiking anything that is fun and worth sharing! About Youtuber "Family Travel with Colleen Kelly" is a popular American Public Television series now in production on its second season. Join Colleen as she travels with her family and others to discover great destinations for enjoying family fun and making lasting memories. About Youtuber Family Travel is dor families who travel. Real parents, carers, kids and grandparents share their family travel experiences so you can decide which destinations, experiences and attractions will be right for your tribe. Book hand-picked family travel deals. About Youtuber Hello Families - Welcome to Houston Family Trips a Travel Vlog. We are so excited to share our life with you as we travel and take family vacations around the world and explore Houston, TX. There are so many things to do in Houston that we find ourselves keeping pretty busy. So, if you are looking for fun, adventure or just a few laughs tune in to this new family travel vlogs. About Youtuber We're a family of six conducting an experiment in family travel around the world--doing things differently, seeing the world differently, and noticing the impact it has on each of us and our family. About Youtuber The Family Backpack website takes the best family travel blogs and their posts and makes the curated content searchable enabling busy parents to plan family vacations much faster and easier. The Family Backpack YouTube Channel puts a new spin on that by taking the stories, advice and the tips & tricks from interviews with moms and dads to help you learn what makes family travel easier. 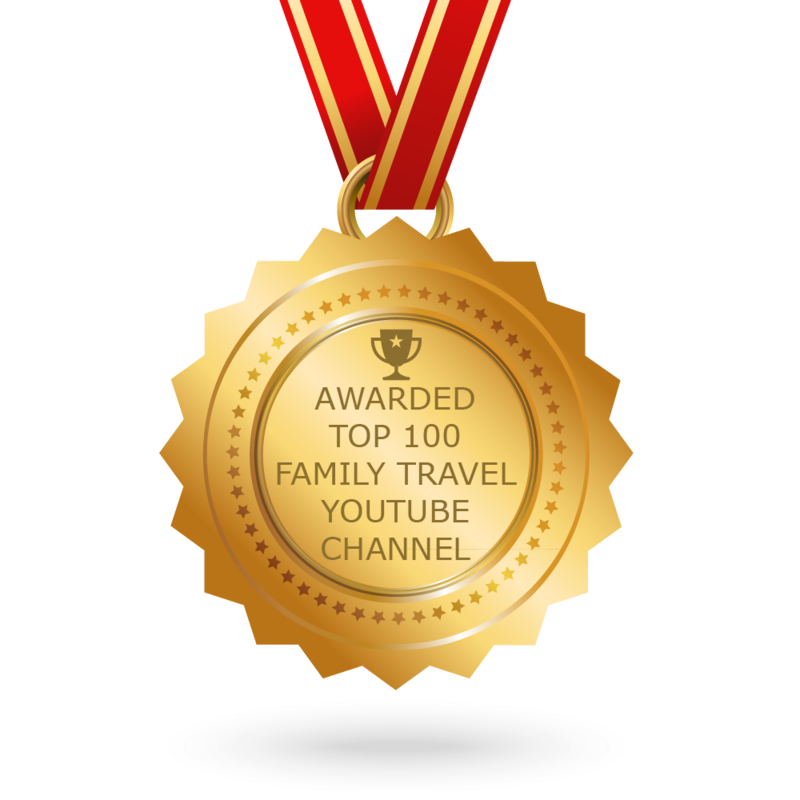 CONGRATULATIONS to every youtuber that has made this Top Family Travel Youtube Channels list! This is the most comprehensive list of best Family Travel Youtube Channels on the internet and I’m honoured to have you as part of this! I personally give you a high-five and want to thank you for your contribution to this world.